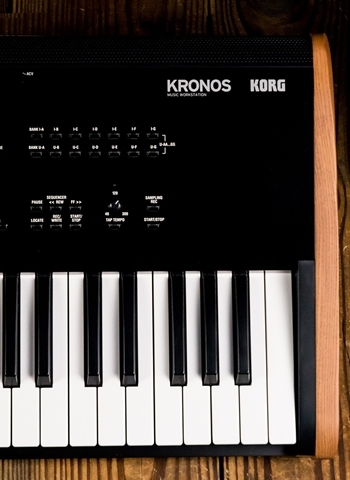 NEW Korg Kronos 88 Nine Distinct Sound Engines. Enhanced SGX-2 Grand Piano Sound Engine. Color TouchView Display—Now with Touch-Drag Capability. 16-Track MIDI Sequencer / 16-Track Audio Recorder. 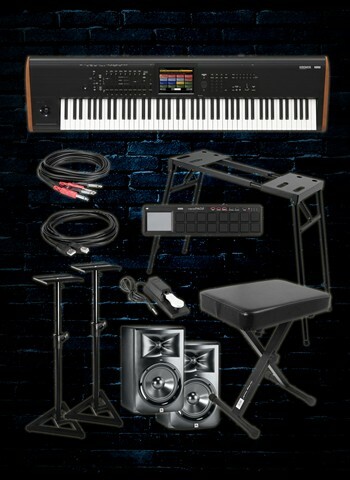 USB/MIDI Host Ports Accommodate MIDI Control Surfaces. Smooth sound transitions that eliminate dropouts when changing sounds, regardless of the mode you're in. Flagship RH3 Weighted Hammer Action(73 and 88 key). Natural Touch Semi-Weighted Action(61 key). On Stage KS7150 Platform Style Stand. Fully adjustable, perfect for large format keyboards, mixers, or for DJ use. An optional Universal 2nd Tier unit can be attached. (KSA7500) Folds flat for storage. On Stage KT7800Plus This deluxe design combines a 3" cushion which provides deluxe comfort for hours of play. A spring loaded double dead-bolt locking mechanism keeps the bench at your desired height with complete peace-of-mind. Korg NanoPad2BK The Korg nanoSERIES2 of ultra-compact and low-profile USB-MIDI controllers will fit perfectly in front of your laptop computer or desktop keyboard, offering impressive control while conserving valuable set-up space. 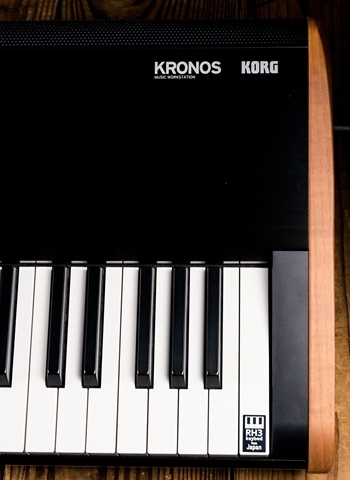 Simply connect a single USB cable, and you've got a music production studio on your desk at home or on the go. JBL LSR308 Pair Bi-amplified Studio Monitor Pair with Magnetically-Shielded 8” Low Frequency Transducer and 1” Soft-Dome High Frequency Transducer and Image Control Wave Guide. Class-D 56 Watt RMS Amplifier for LF, and 56 Watt RMS Amplifier for HF. Balanced XLR and 1/4” TRS Inputs with Detented Level Control, HF and LF Trim Controls. Hosa CPP203 Audio Interconnect: Dual Unbalanced 1/4" Male to Unbalanced 1/4" Male Length: 3m / 9.9 ft.
Hosa USB210AB The Hosa 10' USB 2.0 Cable with USB-A to USB-B connectors helps you achieve maximum performance from your USB devices. Now you can connect your USB printer, scanner, external hard drive, and other peripherals and enjoy error-free data transmissions at up to 480Mbps. This quality cable is constructed to be 100% compliant with current USB specifications and is hot pluggable. On Stage SMS6000P This monitor stand pair is designed with home and project recording studios in mind. The height adjusts for listening while sitting or standing and it locks in place with a security pin. Three removable leveling spikes on the bottom of the base keep this near-field monitor stand stable on any carpeted surface. Entire stand breaks down into three pieces for easy storage and travel. Package modifications can be made if neccesary, but may result in modified price as well. Call or email if you need more info.